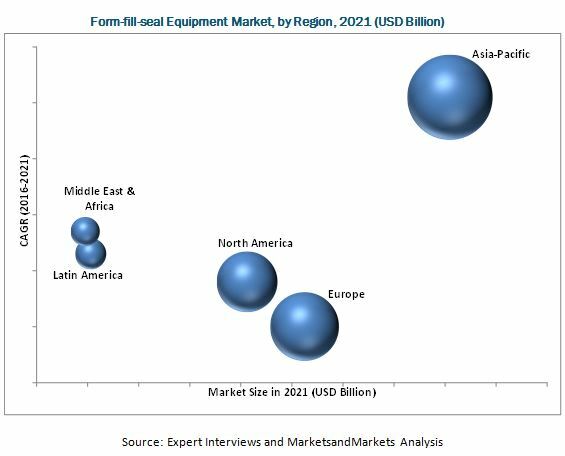 [192 Pages Report] The global form-fill-seal equipment market was valued at USD 14.69 Billion in 2015 and is projected to reach USD 19.47 Billion by 2021, at a CAGR of 4.92% from 2016 to 2021. The increasing demand for various applications from the food & beverage, healthcare, pharmaceuticals, consumer, and chemical sectors is the major factor driving the growth of the form-fill-seal equipment market. Additionally, with rapid urbanization, growth in the packaging industry, and increasing demand for flexible packaging across the globe, there is a rapidly increasing need for form-fill-seal equipment. The base year considered for the study is 2015, and the market size is forecasted from 2016 to 2021. This report has been segmented on the basis of type, product, end-use, and region. Growing consumer product packaging industry with several personal care products will drive the form-fill-seal equipment market. Rising demand for retort packaging with extended shelf-life would drive the form-fill-seal equipment market. The global form-fill-seal equipment ecosystem comprises form-fill-seal equipment manufacturers, distributors, and suppliers such as Robert Bosch GmbH (Germany), SACMI FILLING S.P.A. (Italy), I.M.A. Industria Macchine Automatiche S.P.A (Italy), Haver & Boecker (Germany), and Pro Mach (U.S.). These provide solutions to end users to cater to their unique business requirements and needs. This research report categorizes the form-fill-seal equipment market based on product, type, end-use, and region. On the basis of end-use industry, the form-fill-seal equipment market has been segmented into food & beverages, pharmaceuticals, personal care, and others which include chemical, automotive, hardware, and industrial sectors. Food & beverage accounted for the largest market share in the form-fill-seal equipment market in 2015. Factors such as rising demand for 100-calorie packs, popularity of pre-made meals, coupled with the growing demand for convenient packaging will drive the food & beverages packaging industry. Increasing instances of food packaging in retort and stand-up pouches present an opportunity for this market to grow further. Food packaging convertors are adopting new and improved technologies for effective and efficient packaging. Hence, form–fill-seal equipment with its accuracy, higher production rate, and economical features are used by large numbers of manufacturers for food packaging. On the basis of type, the form-fill-seal machine market has been segmented into horizontal FFS and vertical FFS. The demand for vertical FFS equipment has driven the market with its various features such as quick setup and changeovers, proven reliability, ease of operation, minimal maintenance, and reduced operating costs. Stand-up pouches are made on HFFS machine using a film or a laminate, which are gaining popularity across the globe. The market was dominated by the Asia-Pacific region followed by Europe, in terms of value, in 2015. Asia-Pacific is projected to be the largest as well as the fastest-growing market during the forecast period, due to the growing demand from the food & beverage and healthcare industries. Other factors such as rising sales of flexible plastic packaging due to the shift from cans to stand-up pouches will also drive the form-fill-seal equipment packaging market. The global form-fill-seal equipment market is highly competitive with a large number of players. The major players in this market are Robert Bosch GmbH (Germany), SACMI FILLING S.P.A. (Italy), I.M.A. Industria Macchine Automatiche S.P.A (Italy), Haver & Boecker (Germany), Pro Mach (U.S.), The Aagard Group LLC (U.S.), MDC Engineering Inc. (U.S.), Mespack SL (Spain), and ARPAC LLC (U.S.). 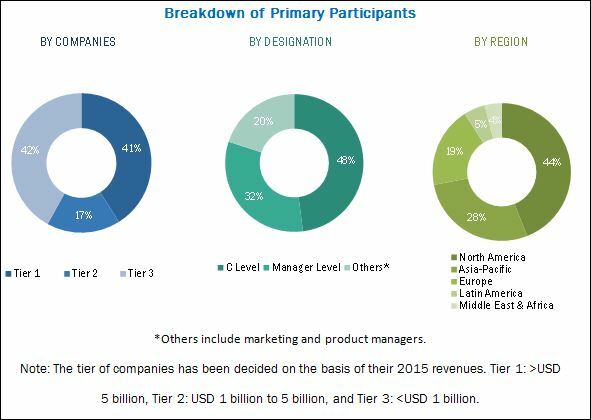 These players adopted various organic and inorganic growth strategies to expand their global presence and increase their market share. Some of the key strategies adopted by the players include new product developments, investments, expansions, acquisitions, and agreements. The form-fill-seal equipment industry includes manufacturers, suppliers, and distributors. Since the past few years, this sector is gaining a slow but steady growth globally due to technical performance of the global form-fill-seal equipment. 12.3 I.M.A. Industria Macchine Automatiche S.P.A.
12.11.4 Rovema North America, Inc.
12.11.6 Fres-Co System Usa, Inc.
12.11.8 Precision Automation Company, Inc.